What a trip this experience has been! It really started several years ago when I took a music composition class. That’s when I first learned how to use the software app, Logic, and began to sense the potential for scoring right at my very fingertips (and in my ears!). The sound class this term with Dale Sherrard was fabulous, and picked up where the music comp class had left off. Score for Berlin: Symphony of a Great City from Crystal Kingston on Vimeo. I spent the semester collecting sounds with my sweet little Olympus field recorder. In fact, building my sound library became something of an obsession. I recorded a lot of stuff! If I was in a particularly intense mood driving home from school, and the radio was playing a song that seemed to catch my emotions, I’d whip out the recorder. I have hours of Dodge Ram diesel truck sounds; going over highway groove bumps, racing with a Harley guy, stopped at a gas station next to a truck full of squawking ducks! Crazy stuff. You never know when you might want to put those sounds in a film, I reckoned. Even if they don’t sound so great you can modify them in Logic. After all, I had made a song out of sounds using only paper, plastic, wood, metal and glass. Our final project in the class was to score five minutes from a classic black and white silent film — Berlin: Symphony of a Great City, 1927. Dale prohibited us from using music we found on the Internet, but we could use music if someone we knew made it. You can find the original full length version of the film here. So on a day when I was in the University Center, sitting there collecting noise (there was also a ping pong table set up nearby where people were playing), a young man walked over to the piano and started to play. I was quite amazed by his virtuosity. I didn’t know what song he was playing, but it sounded like something that Rachmaninoff might have written. When he finished, I asked from across the room and he confirmed that it was. (Everyone who has seen the movie Shine knows how hard his compositions are to play.) Later, I gave him my card and said I’d put it on YouTube when I found the time. Well, that’s what I thought I had done! 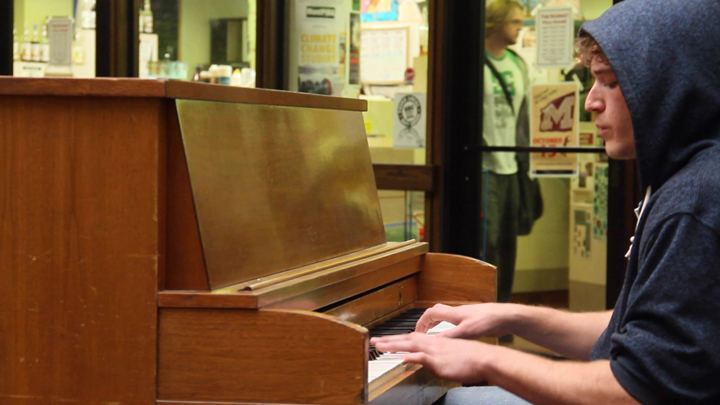 As it turns out, this young man has a doppelganger at school who also plays the piano! The second fellow’s name is Gabrial, and I’ve been corresponding with him for several days. I wanted to give him credit since I used the Rachmoninoff in my project. Today we finally figured out that he wasn’t the same guy! Now I have a mystery on my hands, and I don’t know who to credit for the beautiful rendition of Rachmoninoff’s Piano Sonata No. 2 in b flat minor, Op. 36. (Figuring out which tune it was took an hour of listening to 50 other Rachmoninoff pieces before I found which one it was. That was really fun. He was amazingly talented, and so are the pianists who play his work.) I left a message with the Music Department Chair, and sent him a photo of the talented young musician, in hopes that he may be able to identify the pianist. That’s assuming he’s actually a music major, and not studying something stupid like accounting! I jest, of course. Nothing wrong with studying accounting, per se. But to waste such talent in exchange for a lucrative career… that would be terrible. Gabrial is a fine arts major, he said, and I approve of that wholeheartedly! Even though I know firsthand how hard it can be to make a living. I should have noticed they were wearing different colored shirts! Even Gabrial remarked on how similar they look, though, so I don’t feel so stupid! *Note: I just got a reply from the Music Department Chair. He said: Hi Crystal. 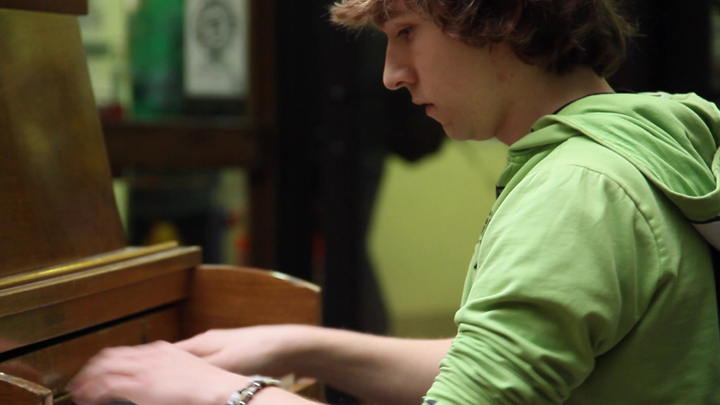 This picture is of our piano major, Damian Garvey. I see him tomorrow for an exam and will try to remember to let him know this site so he can see what use you made! Making the vocal parts was so much fun. Two of my beautiful and talented girlfriends — Abby and Tabitha — came over, and we got into the wine! We spent all day and into the night singing and drinking wine and having a blast. We must do that again sometime soon, I hope. All things considered, this was an excellent assignment. I learned so much from doing it, even if it was really hard and took a long time. I hope you enjoy my version of Berlin: Symphony of a Great City. Thanks again to the musicians who helped. You made this project happen for me. Artist-owned giclee print shop and art gallery in NW Montana, on the Flathead River near the National Bison Range. Free delivery to Missoula. Crystal is just a few assignments away from completing her BA in Media Arts at the UofM Missoula. This entry was posted in Composing Music, Editing Film, Film, School Assignment, Video. Bookmark the permalink.